Which teams have the longest winning streaks in the NFL right now? How they have done it: The Rams have been dominant on both offense and defense. Head coach Sean McVay took the NFL by storm last year with his fresh and innovative play-calling, and it has continued in 2018. So far, no one has been able to stop them as they've rattled off at least 33 points in six of their eight wins. Offseason acquisitions on both sides of the ball have proved helpful, as Ndamukong Suh, Marcus Peters, Aqib Talib and Brandin Cooks have all upped the level of talent on this team, who look like a Super Bowl favourite from the NFC. Hot hand: Through seven games, Todd Gurley has been invincible and playing to the level that earned him Offensive Player of the Year in 2017. He has 1,151 yards from scrimmage and 15 touchdowns, leading the way for the terrifying Rams attack. How they have done it: The ever-consistent Sean Payton and Drew Brees have given the Saints the best point-scoring offense in the NFC and New Orleans, like the Rams, look almost impossible to slow down. During the win streak, they've had two dominant wins over the Giants and Redskins, and three awfully-close victories over Cleveland, Atlanta and Baltimore. Defensive questions still remain, but Brees, running back Alvin Kamara and wide receiver Michael Thomas are all starring. Hot hand: It has to be 18th-year pro, 39-year-old Drew Brees. This season, he's thrown 14 touchdowns compared to only one interception, has the best completion percentage and quarterback rating in the league. He can carve any defense apart. How they have done it: It wasn't a stellar start from New England. After an opening-day victory, they dropped two straight and didn't look quite right. Since then? They have scored 36.4 points per game and scored 19 touchdowns. There's no doubt Bill Belichick and company want to make up for their Super Bowl loss last season, and they look as dangerous as every. Hot hand: Statistically, it looks like a down season from three-time MVP Tom Brady: He has thrown five picks in the last five games and seven on the season - already just one below his 2017 total. But don't let that fool you. 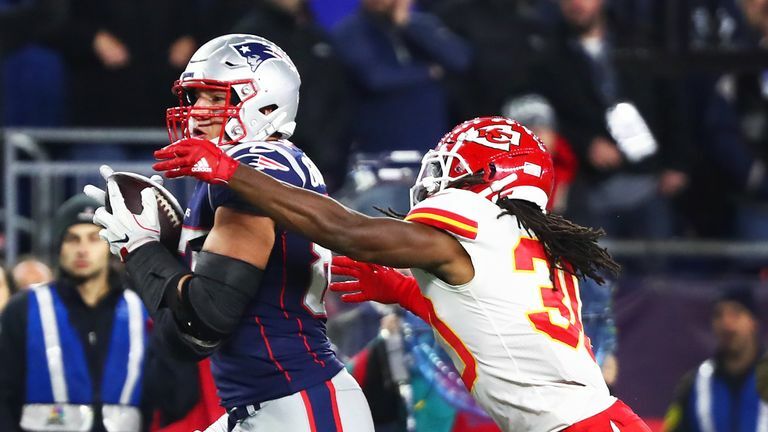 He managed three total touchdowns in Week Four, four in Week Five, and out-dueled upstart Patrick Mahomes in an epic offensive battle against the Chiefs in Week Six. Another three scores against the Bears in Week Seven continued his fine form. How they have done it: The Chargers have won every game they've played against teams not called the Los Angeles Rams and Kansas City Chiefs; the two teams with the best records in the NFL. On offense, they are balanced - 11th in passing, ninth in rushing and seventh in total yards per game, while the defense is improving every week. They haven't allowed over 19 points in three straight games and came up with a huge stand to stop the Titans at Wembley. Are the Chargers built for a Super Bowl? Can the Los Angeles Chargers finally get over the hump and win a Super Bowl in Philip Rivers' 15th NFL season? Hot hand: Philip Rivers, like Brees, is playing even better with age, and is playing at career-best levels in completion, touchdown, and interception percentages, as well as QB rating. He's thrown multiple touchdown passes in every game this season and five of his last six scores have gone for 29 yards or more. How they have done it: Quite quietly. Having lost their first three games, many people had decided Houston's season was over. But they've now rattled off five straight wins, while AFC South rivals the Titans and Jaguars have both lost three straight. The Texans don't stand out in any major category offensively or defensively, but they are winning as a team. The streak began with two overtime wins, and with a favourable schedule coming up, they have a chance to extend it even further. Hot hand: Or rather, hot hands. Sixth-year wideout DeAndre Hopkins is tied fifth in receptions, third in receiving yards, first in plays of 20 yards or more, and second in first downs. Not only is he crushing statistically, but 'Nuk' has made game-changing plays in each of the Texans' victories this season. Expect him to go to the Pro Bowl for the third time this season. They don't have the streak, but the Chiefs are right up there with the Rams when it comes to the 'heat' factor - they are red hot. Outside of the 43-40 last-second loss on the road to New England, Kansas City look unstoppable. They have scored 38, 42, 38, 27, 30, 40, 45 and 30 points - absurd numbers - and Mahomes is an early MVP candidate. Don't be surprised to see them string together another streak soon.